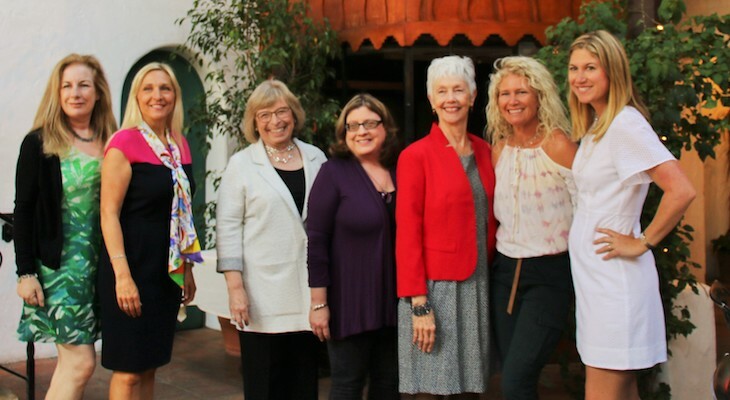 It was a packed house at the El Paseo Restaurant where the Association for Women in Communications awards luncheon honoring Beth Farnsworth, KEYT Journalist/TV Anchor, and Kymberlee Weil, Strategic Samurai were held to present them with the 2019 Women of Achievement Award before members of the AWC-SB, family members, friends and area media representatives. Beth Farnsworth, journalist and anchor at KEYT-TV was introduced by her husband and co-anchor C.J. Ward who shared some fun stories on their work together in their youth, their marriage, and the joy of watching their two daughters grow up in Santa Barbara. He ended in tears saying “I love her so much,” and there was hardly a dry eye in the place. Beth came to the mike with a napkin to catch her own tears and shared some humorous moments along her career path and also the challenges she met to become the outstanding professional she is today. She expressed her gratitude for knowing great people like Ken Harris and Debby Davidson along the way. Beth thanked all of the KEYT3 staff and family members seated at her table, as well as senior reporter John Palminteri who was covering the event, for their support. She expressed her thanks to all the members of AWC-SB for honoring her for her work. Starshine Roshell, a former award recipient, who looked stunning in fuschia was a fantastic emcee, and asked the audience to give it up for event sponsor SB Independent. “It takes a group like this (the SB Independent), one that helps you be the best you can be in the world and always have each others backs to make a real difference.” Starshine Roshell, Perie Longo, Beth Farnsworth and Kymberlee Weil were all presented flowers by members of Girls, Inc. of Greater Santa Barbara. Throughout the luncheon wonderful gifts were raffled off including items from SBIFF, LA Lieff, Impact Hub, A&L UC Santa Barbara, Corepower Yoga, Santa Barbara Polo & Racquet Club, Uncorked Wine & Tasting Kitchen, Les Marchands, Coast to Coast Collection, Sonos and our Mayor Cathy Murillo was very pleased to have won a beautiful bag filled with books written by authors of the AWC-SB including Christine Bell, Elizabeth Gould M.S., Nancy Seagal, Starshine Roshell, Dale Stamos, Mary Sterns, Lois Phillips, Anita Perez Ferguson and Carolyn Jabs. Mayor Cathy Murillo, Gregg Hart and a representative for Hannah-Beth Jackson presented proclamations honoring the recipients. It was an afternoon filled with respect and support for the communication community in Santa Barbara and also a gathering of writers who have spent years getting the news out, publishing books, presenting TV news and all other areas of communication where getting the story out matters. Previous AWC-SB Women of Achievement Honorees include Dr. Carrie Hutchinson 2018, Helene Schneider 217, Lois Capps 216, Sigrid Wright 215, Nancy Leffert 2014, Kathleen sharp 213, Paula Lopez & Perie Longo 2012, Lynda Weiman & Starshine Roshell 2011, Sarah Miller McCune & Marcia Meier 2010, Catherine Remak & Ann Louise Bardach 2009, Deborah Hutchinson & SBNP Reporters Jane Hulse, Melida Burns, Dawn Hobbs, Melissa Evans & Anne Davison 2008. Since 1909, the Association for Women in Communications has maintained its goals to promote the advancement of women in all fields of communication, protect First Amendment rights and responsibilities of communicators and recognize and encourage excellence throughout the communications industry. The Santa Barbara chapter is the only one in the state of California and its membership includes authors, journalists and broadcasters; entrepreneurs, social media experts and marketers; corporate communicators, coaches and designers; scholars, researchers and students. For additional information or membership please visit http://www.AWCSB.org. Good for her she deserves it.